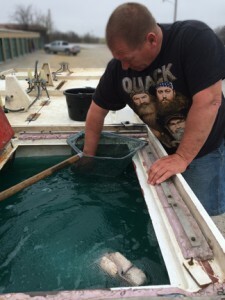 Looking for pond stocking in Graham, Texas? We’ve got a fish truck delivery coming in March! The Stock My Pond fish truck will make a delivery to J&N Feed and Seed in Graham, Texas, on Thursday, March 10th from noon to 1:00 pm. With the unusually warm and wet winter we’ve had, it’s a great time to get your pond stocked and ready for the warmer weather. The Stock My Pond fish truck will arrive at 9 am have channel cat, large mouth bass, black crappie, bluegill, hybrid bluegill, red ear bream, and fathead minnows. Find out what type and size fish we offer on our website. The Stock My Pond fish truck provides containers for all fish but the 11″ channel cats, so please bring your own containers for them. This entry was posted on Monday, March 7th, 2016 at 4:33 pm	and is filed under Events, News & Updates. You can follow any responses to this entry through the RSS 2.0 feed. Both comments and pings are currently closed.